I used Mercy's sketch, SASSC10, to make another cuppy card! 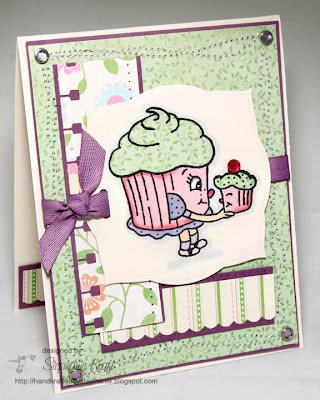 Her fun sketch is on the Stamps and Smiles sketch blog. I colored and paper-pieced her identically to the one in the post below, but I used a different layout and cardstock. This is the card that I gave to Stacy yesterday! I stamped the inside with "Wishing You A Happy Birthday". Accessories: Labels Three Nestabilities (Spellbinders), Cuttlebug (Provo Craft), Markers (Copic), notebook punch (SU! ), ribbon (Papertrey Ink), brads, rhinestone, paper piercer, foam tape, thread, sewing machine. you have made cuppy even cuter than she already was...great job! What a fun card! How cute! Awww Stephanie was an adorable card!! LOVE the great layotu and design, you rocked the sketch! Great fun card! I love all your punched borders.